Kimberly Hand Tied Wig by Envy is perfect for today's fashionista! 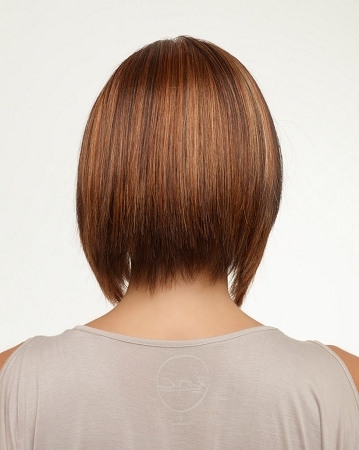 With its razor soft edges and inverted angles Kimberly is symbolic of today's cutting edge trends in hair fashion. Lace front technology from ear to ear offers the most believeable and realistic of hairlines available. Hand tied features through-out make Kimberly soft, lightweight and natural for women of all ages. All the beauty you've been longing for, with the comfort you desire. Alan has created this collection specifically for women with hair loss, but with the same exquisite detailing that makes hand-tied styles the choice of Hollywood stars. Our fully hand-tied, Lace Front Mono Top wigs are made with single layer ultra-fine mesh fabrics, creating seamless caps that are extremely lightweight for cool comfort while blending with any skin tone, creating the illusion of natural hair growth, for the most realistic in styling flexibility. Ultra-lightweight caps offer cool and comfort and the most natural looking hairline for off the face styling, making it a stellar choice for any woman.